First we have the beautiful opening from Gankutsuo better known as The Count of Monte Cristo a series famous for its unusual visual style. The music and the the video animation are great to get you into the mood of the series, which by the way, it's quite good, you should give it a try. May not have the greatest visuals but I like it because I have a funny story with this one. I have a friend who is a huge, HUGE fan of Radiohead, but he wasn't very interested in Anime, so one day I told him, hey there's this series called Ergo Proxy and the ending song is Paranoid Android by Radiohead. He took the bait and never looked back, so now I have one more person to discuss Anime with. The second song of the list which was not composed specifically for the series, but it fitted so well. The song and the visuals are pretty good as it is the series. Eden of the East is one of the best shows to air in the noitaminA time slot, so you should check it out. As a random aside, Funimation which did the English release had some issues with the music license, so only the first episode includes this opening, the rest of the episodes uses Michael ka Belial by Hayami Saori. While I was making a preliminary list from memory for some reason the Op theme from Hellsing came to mind, but I was fooled, the song is in almost indecipherable Engrish, but then I remembered the Ending was actually really good so I guess I have to thank the opening theme for that. Yay the first Yoko Kanno composed song of the list. When I was a kid everyone was talking about this show, and I know I watched this when I was younger, but I can't even remember what it was about, but I do remember that the soundtrack was amazing, and both the Opening and Ending themes are great. Okay, t I was having a hard time deciding between this and Call me Call me by Steve Conte, but since I just used a song by Steve Conte, but then I remembered that the ending theme was actually The Real Folk Blues with vocals by Mai Yamane and I was mixing those songs for some reasons, so that made easier to go with this catchy opening tune from the Movie. An incredibly fitting song for the series, it is calmed, relaxed, very soothing and it invokes the same feelings the series does. 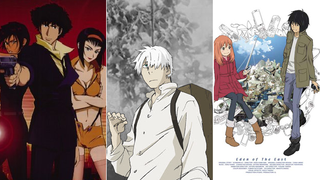 Special mention goes to the second season, Mushishi Zoku Shou, opening: Shiver by Lucy Rose. Another series that may not be everyone's cup of tea (I do like it, but I know a couple of friends who can barely watch the show) but one where the soundtrack was amazing. The Light before we Land by Scottish band The Delgados is a beautiful song and a perfect fit for the depressing tone of the series. Okay let's take a little break. This one is not even and opening or and ending theme, but it is probably one of my favorite tracks from GitS: Stand Alone Complex, I love Ilaria Graziano voice and the chorus have been stuck in my mind for years. Enjoy the song. I know, I know this is almost cheating, since the lead female singer and his brother who's also in the band are the daughter and son of Paul Rodgers and Machiko Shimizu, but still they're a British band so they qualify. The opening theme Duvet is probably one of my favorites openings in general (not only from this list) and the visuals are so fitting to the song as they are to the great series that is Serial Experiments Lain. So yeah there you have it. Now it's your turn to tell me about your favorites and the ones I missed out.